I find it kind of funny that I decided to call this particular post "Fatal Frame II: Crimson Butterfly edition." After all, neither of the games represented below is actually named Fatal Frame II: Crimson Butterfly. The following piece of art, for instance, will grace covers of the Japanese release of this Wii remake, which (I believe) will be called Zero: Akai Chō in that particular region. 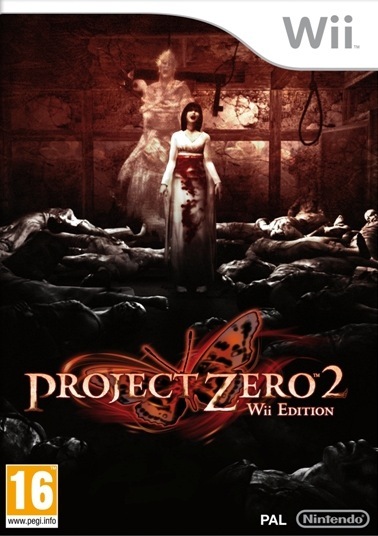 The illustration below, on the other hand, will be used as the box art for the European version of the game, which will sport the rather unappealing title, Project Zero 2: Wii Edition. Both titles will hit store shelves in their respective territories shortly, by the way, with Japanese gamers getting the title on June 28 and their European counterparts getting it a day later, on June 29. 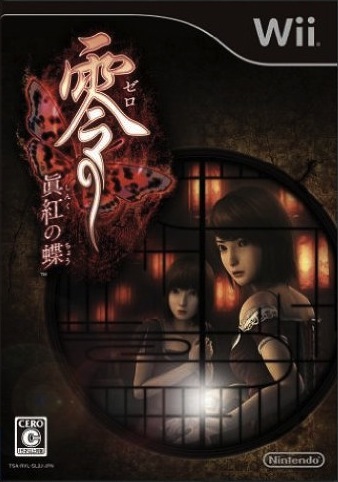 Should this Fatal Frame II: Crimson Butterfly remake be announced for North American release, which piece of art would I prefer to see on its eventual cover? I'm going to go with the European version this time around thanks to its more unsettling imagery. That said, I'm quite fond of the ghost-like logo that was created for the Japanese iteration. Which piece of box art do you ladies and gents prefer? Definitely prefer the Japanese art--it just looks more arty and serious ro me, maybe since it focuses on uncentered female faces (not sure if I 've seen that outside dating sims). The Japanese art is way better, imo. And...the retitle is SO BAD! Ugh. Hey there, Rachel! I'll definitely agree with you that the Japanese art is more "arty." Also, I, too, like that it focuses on the female protagonists (at least, I think they're this game's protagonists). Oh, and I like that the Japanese art appears on a black case -- very cool. That said, I like the Euro art, too. Well, other than the horid title. Ugh. You just took the words right out of my mouth, Justin. Ugh! Yeah, the title of the Euro version is terrible. I'm sure there's a reason the series is called "Project Zero" in Euroland rather than "Fatal Frame," etc., but since I don't know what it is, I'm going to call it crap. Was just thinking, what could've been cool is if they displayed the english title the way the japanese title is displayed in the top left corner, since the game is steeped in japanese myth, and japanese style title would've worked, but to keep the creepy image from the euro box. And yes - I too think Project Zero is a stupid stupid name change! Don't understand why it can't stay as Fatal Frame! Fatal Frame is more fitting since it relates to a camera. Project Zero - gives ZERO indication on what its about. Ok apparently (and maybe someone who understands japanese can confirm this) ZERO in japanese is very close to the word for ghost. Some people are also saying its a type of word play. Some people say Project Zero could be a translation error/confusion because the team that created the game was called Project Zero. The Japanese one, by far. I like the art better to begin with, but I think the dark strip at the top benefits it. The white strip on the European version "clashes" with the dark imagery, at least to these eyes. I like your idea, Igor -- of the English logo mimicking the ghost-like Japanese logo. Who knows, maybe NOA will do that should the game earn a North American release? BTW, although the explanation you dug up RE: renaming the game Project Zero in Europe makes sense, I still find it kind of stupid. I mean, Zero seemingly works in Japanese because of the wordplay element you pointed out. In English, though, it just doesn't make sense. Like you said, Fatal Frame makes much more sense in English. IvaNEC: Oh, I agree with you wholeheartedly that the black strip across the top of the art benefits the Japanese release, just as the white strip across the top of the art clashes with the Euro release. Really, Nintendo should have instituted the use of these black labels and boxes in all regions, IMO -- especially since the black boxes and labels often complement the art of these more mature titles. And yay on us getting the game before the US! Er I mean...Boo urns! Boo urns! I've been quite surprised with how many games have come out in the PAL regions before the US region. Typically it was always US first and possibly maybe sometime down the line in the PAL regions (if they felt like it). Yes, you're right about the turnaround being a long time in coming for Euro gamers. Still, I wonder why it has to be this way -- why can't EU and NA both get these translated games? Seems kind of stupid to me to do all of that work and then only release them in one territory. Sigh. 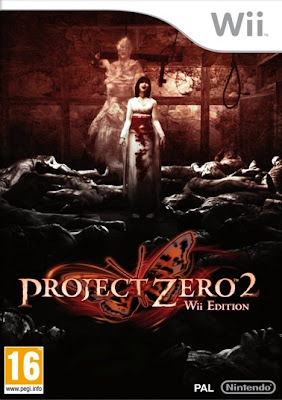 Well, admittedly, "Project Zero" is much closer to the original title than "Fatal Frame" is... The Japanese title has nothing to do with cameras! It's just "zero." Actually, this has got to be one of the toughest box art decisions ever! I like the black case of the Japanese version, along with the general color scheme... And though I agree that it's nice that the cover focuses on the female characters, I personally don't like their angled, fearful poses... But then again that's how they are in the game and maybe I'm looking too much into things! The European box art is pretty scary/intriguing, though! Hi Anne! Ah, someone who kind of agrees with me -- or at least likes the EU version well enough. I don't know what it is, exactly, but something about the Japanese cover turns me off. Maybe it's the cowering female protags, like you said? Anyway, both options are good, but hardly perfect, in my opinion. Just saw a comment relating to game covers in Japan that reminded me: when a game is rated 15+ it has the black strip on it.